This cake — a cross between a custard and a frittata — tastes best at room temperature, so it's best made several hours ahead of time. It's great on a picnic, or as part of a cold lunch. It can be made with other greens, such as chard, mustard or turnip greens, or nettles. Made with spinach, the cake is a brilliant green, its flavor deeply satisfying. To make the spinach cake: Cut the spinach into 1-inch-wide ribbons, discarding any tough stems. Swish the greens in a large basic of cold water, then lift them out to a colander. Repeat the process 2 more times, with fresh water each time. It is tempting but unwise to stop after 2 washings. After the third washing, you shouldn't see any sand or grit in the water. Trim the leeks and peel off the tough outer layer. Cut the leeks into small dice. Fill a bowl with warm tap water and add the leeks. Agitate the leeks with your hand. Let the dirt and sand settle in the bowl, then scoop the leeks from the water. Repeat the process 2 more times. Melt the butter in a deep, heavy-bottomed pan over medium heat. Add the leeks, season with salt and pepper, and sauté, stirring occasionally, until they are tender but still green, about 5 minutes. Turn up the heat and scrape a little nutmeg over the leeks. Now add the drained spinach in layers, sprinkling each layer with a little salt. Cover tightly and let the spinach steam rapidly over the leeks, removing the lid to stir once or twice. (The water clinging to the spinach will provide enough moisture for steaming.) When the spinach is just barely wilted, 2 minutes or less, turn out the contents of the pot onto a platter and let cool. Be sure to save any cooking juices that have accumulated. Preheat the oven to 400 degrees F. When the spinach-leek mixture is cool, taste for seasoning and adjust — it should be highly seasoned. In a blender or food processor, puree the cooked vegetables with the milk and eggs in batches, adding a little more salt, pepper, and a pinch of cayenne. Add any remaining cooking juices to one of the batches and whiz again. 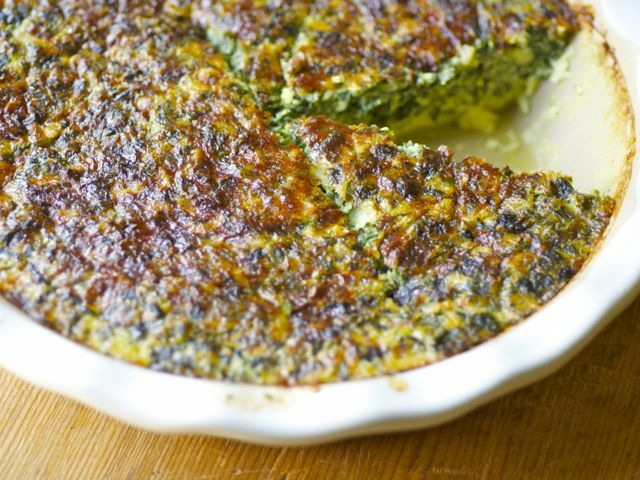 Pour the soupy green batter into a buttered baking dish or a 9- or 10-inch deep-dish pie pan. Grate a scant 2 tablespoons Parmigiano over the top, and bake uncovered for 45 minutes, or until a knife inserted in the center comes out clean. Cool to room temperature. Cut into wedges and serve with the herb salad. To make the herb salad: Wash and gently dry the arugula and lettuce leaves. Trim the endive, if using; discard the outer leaves, and slice crosswise about 1 inch thick. Combine with the washed greens and wrap in a clean towel and refrigerate until ready to serve. Pluck the herb leaves from their stems, tearing larger leaves into rough ribbons. You will need roughly 2 cups of a mixture of sweet herbs, plus a few chopped celery leaves. Prepare the vinaigrette: Macerate the shallot with the lemon juice and a little salt. Then whisk in the olive oil. Add a little freshly ground pepper.